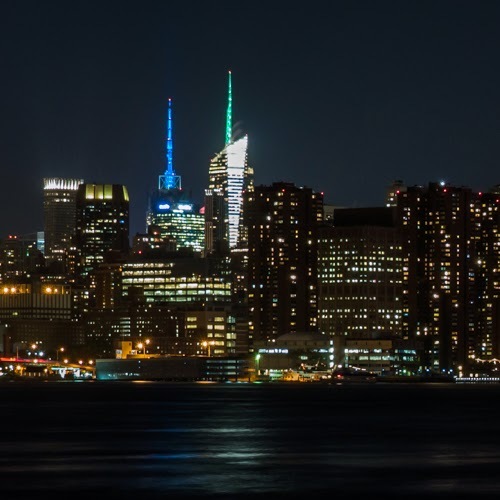 Barbizon Lighting Company Blog: Barbizon Lighting Projects Illuminate the New York Skyline for the NFL Championship Week. Barbizon Lighting Projects Illuminate the New York Skyline for the NFL Championship Week. In coordination with the NFL’s unveiling of the roman numerals XLVIII on Super Bowl Boulevard in Midtown Manhattan three iconic buildings in New York, the newest being One World Trade Center, 4 Times Square (H&M Building), and One Bryant Park (Bank of America Building) were lit orange honoring the AFC Champion Denver Broncos and bright green honoring the NFC Champion Seattle Seahawks starting Wednesday, January 29. Over the course of the weekend the two team’s colors alternated until the game’s conclusion on Sunday, when the Seattle Seahawk’s bright green was seen across the entire metropolitan region celebrating their win. 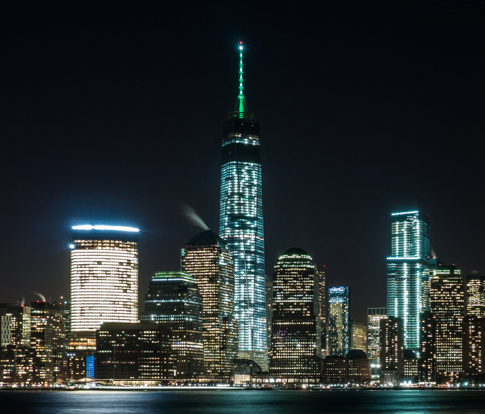 Barbizon Lighting’s New York office has coordinated installation of energy-efficient, color-changing lighting on all three these three iconic landmarks. The lighting systems that Barbizon installed and commissioned can all be remotely controlled and were coordinated by the Durst Organization. For more information about these projects or to explore architectural lighting for your building contact your local Barbizon Lighting office.